From Norway to Shanghai: Where Indiana’s international town names come from? If you’ve ever chuckled (or shook your head) over some of the names and, more importantly, Hoosier pronunciations of some of Indiana’s cities and towns, then you’ll want to locate an old copy of Indiana Place Names by Ronald L. Baker and Marvin Carmony (Indiana University Press, 1975). It’s a fascinating look at Indiana place names and their origins. Some active little hamlets in their day are now little more than an intersection of roads. You’ll also be surprised by the number of cities and towns that have changed names. Warsaw: Kosciusko County – Warsaw was named after the capital of Poland and the county after Polish and American Revolutionary War hero, Tadeusz Kosciuszkko. Norway: White County – Originally named Mt. Walleston, the name was changed to reflect the early Norwegian settlers. Crete: Randolph – Allegedly named after a local woman named Lucretia. Shanghai: Howard County – Named for Shanghai chickens owned by a resident in the area. Those chickens are now called Cochin. Russiaville: Howard County – This is an interesting one. The town is pronounced “Roo-sha-ville”. It was named for Jean Baptiste de Richardville, which through the decades was somehow mangled to what we know now as Russiaville. The school’s mascot until 1949 was the “Cossacks”. While the pronunciation of Russiaville precedes the cold war, many insist that the pronunciation was to disassociate itself from Russia. Perth: Clay County – Named after a town in Scotland, not Australia. New Amsterdam: Harrison County – Possibly named for New Amsterdam, the former name of New York, a 17th-century Dutch settlement. New Amsterdam is the smallest town in Indiana with a population less than 30. Pekin: Washington County – Named for Peking, China, but dropped the “g”. Canton: Washington County – Not China, but rather Canton, Ohio. Frankfurt: Clinton County – The Pence brothers settled on the land requesting the town be named for their German great-grandparents’ home of Frankfurt. Versailles: Ripley County – Named after the Palace of Versailles, but not pronounced Ver-sigh, but rather Ver-sales. Milan: Ripley County – Named for the Italian city, though again, it’s not the uppity mi-Lan, but rather MY-lun. East Coasters can’t look down on Hoosiers here either, there is a Milan, New York and they pronounce it the same way we do in Indiana. Hindustan: Monroe County – Hindustan is the ancient Persian name for India. Poland: Clay County – Not the country, but rather after James Alexander Poland, the town’s founder and first blacksmith. Vevay: Switzerland County – This one is a two-fer with the town and county named by Swiss immigrants after their homeland. Pronounced Vee-Vee, not Ve-Vay. The annual Quality of Place Conference in Richmond hosted by Richmond Columbian Properties is scheduled for Thursday September 27th from 8:00 AM to 1:30 PM. The conference brings together speakers and experts on establishing quality of place and increasing the quality of life in towns and cities. This year’s conference will focus on historic neighborhoods that have declining conditions and problems with blight. Key topics will focus on focus on developing identity and empowerment, housing rehabilitation for affordable housing, improving public services, code enforcement and landlord/tenant issues, and programs to deal with drugs, crime and homelessness. The conference is held at the William G. Scott House just off the National Road in Richmond! Historic filling stations often have unique character and are reminiscent of times gone by compared to the gas stations being constructed today. Indiana Landmarks featured an article on their website this month about historic filling stations being saved and reused to serve other functions. At one point in time the National Road would have been lined with unique filling stations like these but many have been demolished and the ones that remain are often threatened. In 1999, the Indiana National Road Association played a major role in saving a cottage-style filling station in Terre Haute. The little structure faced the threat of demolition and donors funded a move to the Rose-Hulman Institute of Technology athletic fields to serve as a concession stand after restoration work. This project saved it from the wrecking ball. The Dublin Friends Meetinghouse, constructed between 1878 and 1879, is one step closer to being listed on the National Register of Historic Places. The Indiana Historic Preservation Review board will make a decision on the nomination at their next meeting scheduled for 2 PM July 18 at the Bona Thompson Memorial Center in Irvington (5350 University Ave. Indianapolis). The Italianate church boasts many original architectural features including a multifoil window, relief work, and brackets. The Dublin Friends Meetinghouse has been in continuous operation as a house of worship since 1879 and is just a block of the Historic National Road! Half of the funding for the National Register Nomination came from Indiana Landmarks’ Partners in Preservation Program. The Hoosier Gym, a 1921 historic gym that was featured in the movie Hoosiers, is located just a few blocks off the National Road in Knightstown. The gym is one of Indiana’s historical gems and remains an active gym in good condition thanks to a dedicated non-profit organization. While the gym is no longer associated with a school it is a community center that still sees a lot of basketball played in it and can be rented for special events (we had our annual meeting there in 2016). The Hoosier Gym group is currently raising money for a roof, masonry work and windows. They want to fix condition issues before they become a major problem to ensure that future generations can enjoy the site. They are applying for a $500,000 grant from the Indiana Office of Community and Rural Affairs to help cover the costs. As part of the application process to identify issues and best methods to fix them the group had a study done by Keiser Consulting, paid in part by an Indiana Landmarks Endangered Places grant. There is also an option for those that wish to donate at the Hoosier Gym’s website and help them make the match required if they are awarded the grant. Byway jargon – Viewshed Protection; Wayfinding; Pull-off Interpretation; etc. into what byway organizations can do to best sustain and market their byway. Aug 21-22, 2018; Richmond Indiana – along the National Road. Contact Sharon Strouse, sharonstrouse@gmail.com for registration information and questions. Cambridge City Mainstreet, Inc. has recently reduced the price of a very important piece of Cambridge City’s history! The Matthias and Kline building at 12 W. Main St. represents an important time in the town’s history. In the 1840s Cambridge City was projected to be a major center of trade because the newly constructed Whitewater Canal intersected the well-traveled National Road! During this canal building craze Jacob Matthias and Beneville Kline expanded their dry goods business in Cambridge City while starting a canal line that ran from Cincinnati to Cambridge City. Their business was short lived but they left a lasting legacy with the construction of a downtown building circa 1844. Not only is this historic building one of Cambridge City’s oldest extant buildings but it has an amazing mural, painted by Pamela Bliss, commemorating the 150th anniversary of the Lincoln Funeral Train passing through the area! Don’t miss your chance to own this highly visible piece of National Road history in Cambridge City’s downtown business district! I came across this picture when doing some research on US 40 for our book….and I couldn’t find any information Puff’s Antiques. Does anyone have any further information on it. Does it still exist? Where was it located? Who owned it? Etc. I would greatly appreciate any input that you may have. Brazil, IN – The Clay County Historical Society (CCHS) is hosting a National Road Movie Night in partnership with the Moore Funeral Home and the Walnut Theater. The National Road documentary Movers and Stakers will be shown on July 10th at 7:00 PM in the Walnut Theater. It is free to the public. The historic theater is located right on the National Road at 24 S Walnut St and is locally owned and operated. Movers and Stakers tells 13 historic stories of people and places on the National Road. Movers were people who migrated west and stakers developed towns, churches, colleges and industry. This documentary focuses on the stretch of the National road between Richmond and Terre Haute. “We are promoting U.S. 40 so people realize the heritage and importance U.S. 40 played in our history,” CCHS president Vicki Mace said about the movie night. Dine and Drive the National Road is a unique culinary trail in the form of a passport booklet from Richmond to Terre Haute featuring locally owned eateries! Establishments included in the passport include ice cream shops, restaurants, breweries and more. Many locations offer a special discount or deal for passport holders. The passport will be available at all participating restaurants and various other select locations. 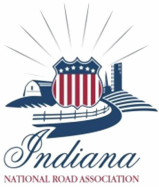 Please follow this link to check out the official site and learn more about where to get your Passport and more about the eating establishments along the Historic National Road in INDIANA!! SO TAKE A DRIVE…AND GO EAT!!! Exploring and Writing about The Historic US Route 40 is the perfect way for us to help celebrate Indiana's Bicentennial 1816-2016.